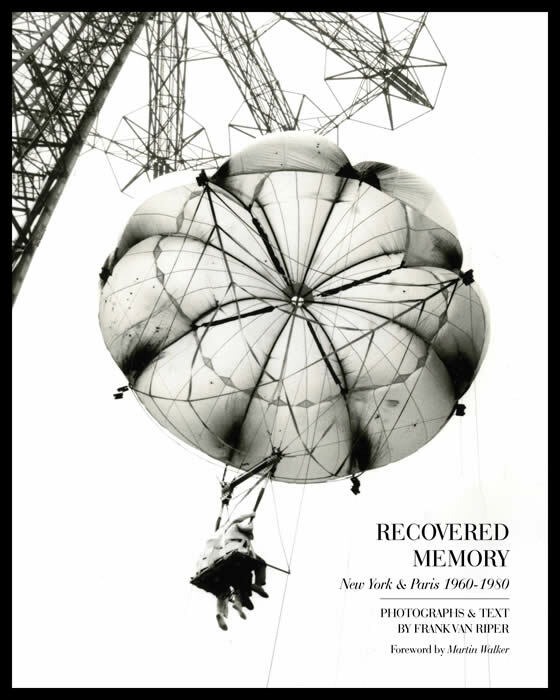 Following is an excerpt from my new book, Recovered Memory: New York & Paris 1960-1980 (Daylight Books, $45.) For signed, inscribed copies, contact me directly: GVR@GVRphoto.com. Text and photographs © Frank Van Riper. All Rights Reserved. To ride the D train back then all you needed was 15 cents and a tolerance for noise. The D train (starting in the north Bronx and ending at Coney Island in Brooklyn) was just one of many New York City subway routes. The A train was probably best known, thanks to Billy Strayhorn’s jazz standard “Take the A Train,” that Duke Ellington made the signature tune for his orchestra in the 1940s. But those were just two of more than two dozen subway routes crisscrossing the five boroughs in such a remarkable grid pattern that anyone could get anywhere in the city--save perhaps for the outer reaches of Red Hook in Brooklyn or West Farms Square in the Bronx—for the same lousy 15 cents. As it happens, both the New York and Paris subways are about the same age. New York’s, the largest rapid transit system in the world in terms of stations—roughly 472—dates back to 1904. The Paris Metro (short for Metropolitain) began operation four years earlier, in 1900, and today is the second busiest subway system in Europe, after the Moscow Metro. Still, Paris’ number of in-city stations (245) is dwarfed by New York’s. (nb: the term “Metro” now has become a default name for virtually all modern subway systems, from Toronto to Washington, DC . Fifteen cents a ride was the fare I knew best when I lived in the Bronx. The basic NYC subway fare was 15 cents from 1953 to 1966 (today it’s $2.75)—the longest time without a fare hike since the subway first opened. If you were lucky and it wasn’t rush hour, your 15 cents let you sit on woven straw seats or, failing that, hang onto spring-loaded steel handles that hung from the ceiling , or failing even that, grab on to a floor-to-ceiling pole, one of many that punctuated every subway car. Above: It wasn't much for looks, but it got you there. Subway entrance in the Bronx, ca 1960s. Below: Paris Metro somehow seemed more human scale, especially in older stations with their curved walls. All images © Frank Van Riper. All Rights Reserved. In postwar New York and into the mid 60s, the New York subway was a fast, convenient way to get from point A to point B, even if it was layered in grime. And you traveled in relative safety. The Paris Metro of the 1980s was an odd mix of the old and new. The most obvious retro nonpareils were the Hector Guimard-designed Art Nouveau subway entrances—simply glorious evocations of the natural world writ large in steel and glass. (One such relic now graces the courtyard of the Museum of Modern Art in New York.) 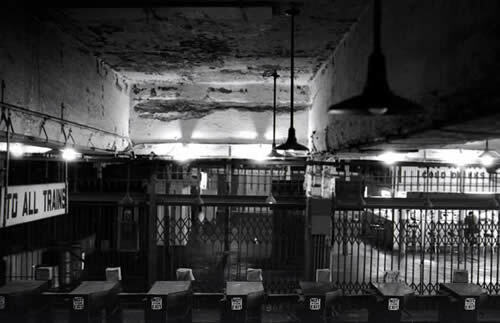 Descend into the Louvre station, or Gare du Nord, or Sevres-Babylone or anywhere on the system and you could see gleaming steel subway cars juxtaposed with dingier ones that seemed to come from New York, or even the previous century. The older ones did have more elan—especially the ones on rubber tires. More important, none of the cars was marred by the graffiti that for a while became the signature look of underground New York. The Paris system also was built on a smaller scale, in that many stations--with their severely curved walls--somehow seemed more intimate. Maybe it was the hugeness of the posters that made one feel small. 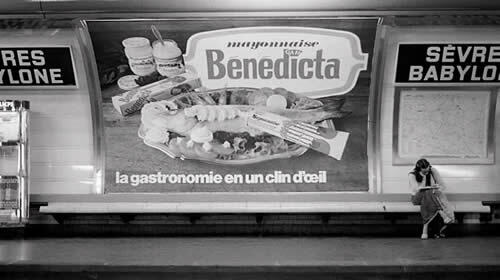 I recall a gargantuan poached trout on a poster maybe ten-feet wide that promoted Benedicta mayonnaise. Too, in that largely pre-computer/pre-digital era, what passed for high-tech direction-finding were large station-mounted electronic maps on which scores of tiny individual light bulbs lined each in-town route. Confused about how to get somewhere? Simply push the button for point A with one finger, point B with the other. Et voila!—scores of little bulbs would light up the most direct route for you. I always thought of pinball machines when I did this. From the 1920s to the 70s another, though little-lamented, feature of Paris stations were portillons automatiques: automatic crowd control gates that closed off the platform when trains were in the station, to keep crowds manageable and safe, especially during rush hour. Fine, except if you were racing to make a train and were blocked out. In that case, it was maddening. Most were dismantled by the mid to late 70s. Don't try this in New York. 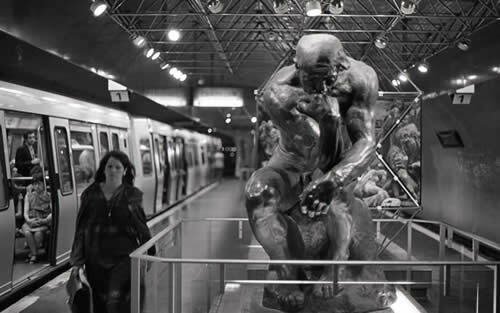 Woman passenger strides by a copy of Rodin's famous 'Le Penseur,' one of several Rodin works displayed in the famed Paris Metro 40 years ago. In post World War 2 New York, there was no such thing as air conditioning in the subway—this was the era when people would sleep on their fire escapes in the summer or go to the movies just to get cool. So in the steaming summertime subway, huge fans tried without success to move the air, several mounted on the ceiling of every car, just a foot or so above your head. The fans’ wide metal blades moved as fast as airplane propellers and, in the older cars, were just as unprotected. Nobody messed with them. Newspaper stands, once the lifeblood of sidewalk life in any big city, proliferated underground in New York as well. Run by the Union News Company, these stands dotted the bigger stations and were every bit as full as their aboveground counterparts, hawking papers, magazines, cigarettes, candy and gum. Vending machines also could be seen on many stations’ steel columns, though I swear I never saw anyone use them. That all changed, beginning in the late 60s. It looked awful—like the bowels of hell. Every interior inch of almost every subway car, especially the newer ones with shinier surfaces, was covered with hideous, crudely scrawled graffiti—don’t even try to call it artistic expression. 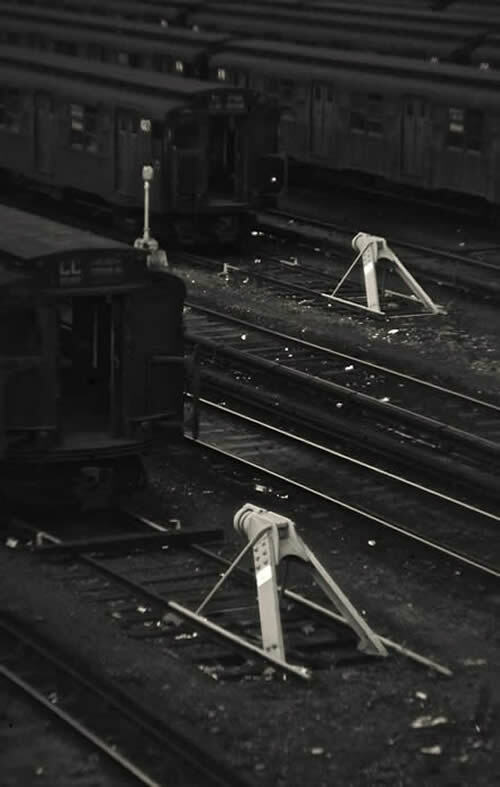 Train exteriors, too, often bore the mark of vandals who roamed the subway yards at night. Thugs preyed on passengers—to the extent that undercover cops had to prowl high-crime stations—and a private group of scowling protectors, dubbed The Guardian Angels, took to patrolling subway cars in white T-shirts and red berets. By contrast, Parisian subways were fairly tranquil, though in the 80’s there was talk that subway crime there had “quadrupled.” But even then, the crime rate was one-eighth of what it was in New York. Bronx subway yard, ca 1960. These stolid grey cars were part of the IND subway line--the line that I more or less lived on during my formative (and car-less) years in the Bronx. 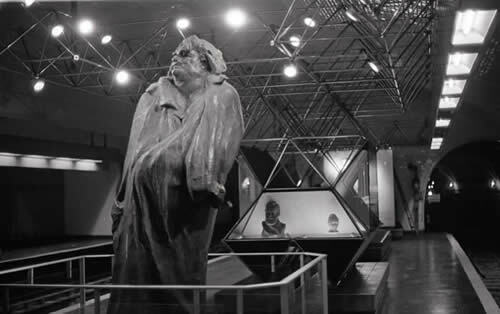 Above: Another Rodin classic--his heroic statue of author Honore de Balzac in the Paris Metro. 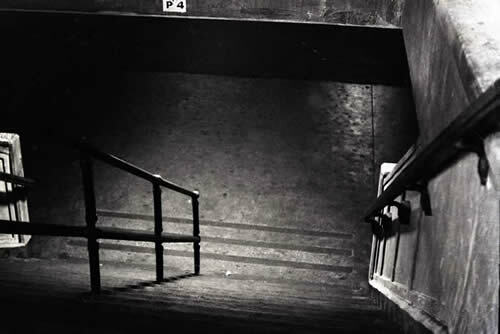 Below: somewhat less elegant, a subway entrance in New York in the 1960s. Subway violence in New York became the fare of TV and movies. I remember as a cub reporter on the Daily News in the late 60s, covering the making of a movie called ‘The Incident,’ about two young toughs terrorizing an IRT subway car full of passengers. The film was not shot on location, but in the old Biograph Studios in the Bronx. There a full-size, largely wooden, replica of an IRT subway car dominated the soundstage—its rumbling movement achieved by stagehands alternately moving huge wooden beams levered under the car out of camera range. 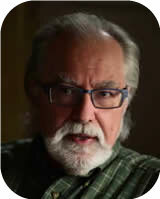 The two young toughs in the film were played by then-unknown actors Tony Musante and Martin Sheen. --Friday evening, Dec. 14, 6-8pm, opening reception: solo exhibition and signing, Photoworks Gallery, Glen Echo Park, Glen Echo, Md.